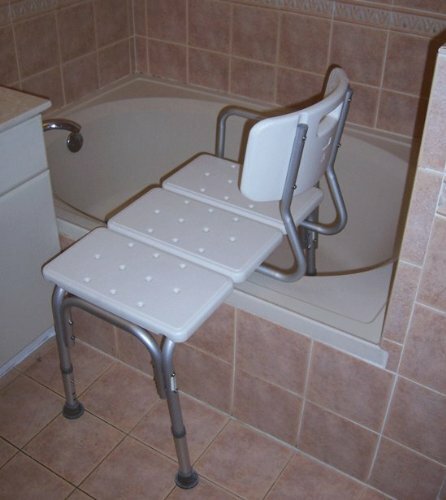 Taking a bath or shower is essential for everyone, but it can be difficult or dangerous for someone who is older or has challenges with mobility to maneuver confidently when they bathe. This is why picking out the best shower transfer bench is extremely important. It can restore confidence and give you the peace of mind that comes with the knowledge that your loved one is safe and independent. Picking out the best shower transfer bench doesn’t have to be a difficult task, and our easy buying guide will outline the important criteria you want to consider when you’re picking out your new one. 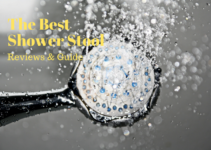 We’ve also rounded up and reviewed the top ten best shower transfer bench products, so you have a starting point when you start shopping. Before we get to our top 10 best shower transfer bench reviews, we’ll outline the important considerations you should keep in mind when you’re shower bench shopping. A lot of shower transfer benches let you adjust the height by half-inch or inch increments so it can fit a variety of bathtubs and showers. Others come with a fixed height, and they don’t let you adjust them to fit your tub or shower. This can make it more difficult to make sure that the product fits your tub. In general, padded shower transfer benches are more comfortable to use and sit on. If you have pressure points, are thin, or you like to take long showers, a padded bench is a good choice. However, the padded benches are usually more expensive than the unpadded versions. Unpadded benches are the more cost-effective options, but they’re also less comfortable than the padded versions. It’s usually easier to scoot from one end to the other as well, and the unpadded benches tend to hold up to wear and tear better than the padded versions. Some transfer benches are one solid piece that you slide across, but some offer pivot seating. This seating comes to the edge of the tub, you sit down, and twist it back into the tub. It’s a safer option because you can strap yourself in and you don’t have to worry about trying to pull your weight across the bench. 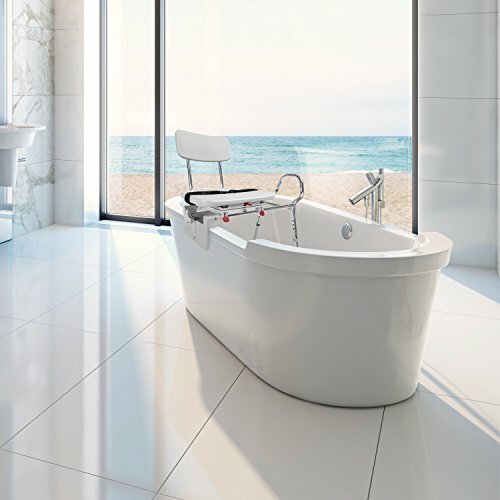 Your bench should work for both left and right-sided bathtubs. But, a lot of benches are designed to go in one way, and you can’t reverse them. So, if it’s possible, look for a shower bench that you can use from the right side and the left side. This way, if you ever take your bench with you, you’re sure that it’s going to work with your new bathtub. Some shower transfer benches have padded feet, and some have suction cups. 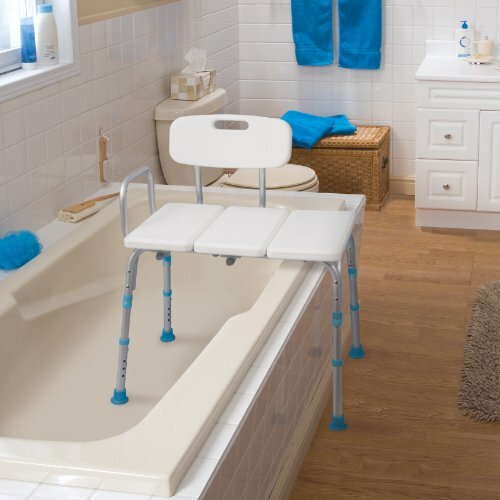 The padded feet can prevent the chair from scratching your floor or your tub, but they don’t add any stability. Suction cups adhere to the tub’s surface and provide an extra layer of security because it holds the bench in place when you use it. The bench’s weight capacity is also another important consideration you want to keep in mind. Some transfer benches will only guarantee weight limits of 250 pounds or lower while other benches will say that they can hold up to 400 pounds. You should always test the chair carefully first to make sure it can hold your weight to prevent injury. This shower transfer bench is professional-grade. It provides effortless sliding and pivoting features for an easy and safe transfer. You get a padded backrest and armrests for additional comfort, and you can also use the option extension bars to raise this bench to an appropriate height. The padding is medical-grade, closed-cell molded polyurethane that repels water and is easy to clean. The armrests can be raised, lowered, and locked into place for a secure seating area, and this is a more compact shower bench due to the swivel chair design. The bright blue color makes key parts of the chair very easy to see. 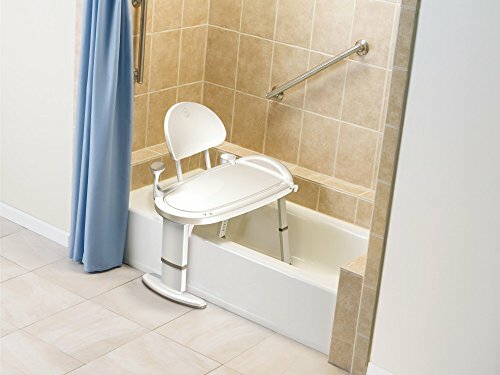 This transfer bench makes it easy for your loved one or yourself to get in and out of the shower. You can adjust the seat so that it sits between 19 and 23 inches from the ground, and the seat slides along the length of the bench quickly and easily. The nylon strap locks the seat in place for added security, and the textured plastic design is durable, and it provides you with a non-slip surface. The frame is made out of aluminum, and this helps to keep the bench lightweight but strong. You’ll get blow molded plastic with this transfer bench, and this adds a layer of stability when you combine it with the backrest. The dual-column extending legs adjust in half-inch increments so you can set it to your preferred height quickly and easily. You can assemble this bench without tools, and it has a sturdy pinch-free lever for additional support. It has a wide seat that’s easy to maneuver, and it has a maximum weight capacity of 400 pounds. The bench itself weighs just 10 pounds, so it’s lightweight enough to move on your own. You’ll enjoy a 24-inch by 15-inch seat with this transfer bench, and it comes with five different height adjustments. 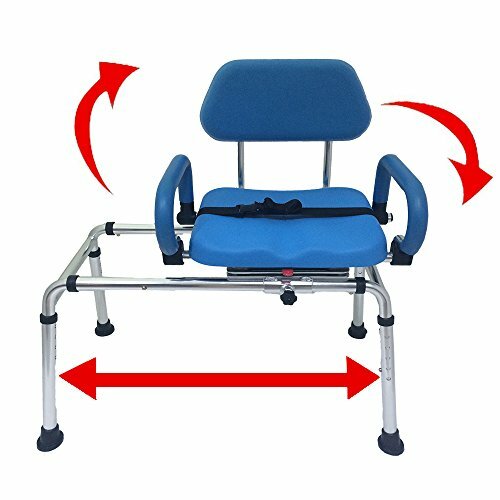 You can assemble the backrest for left or right-handed people, and it provides additional security and support when you use this product. The frame is lightweight but durable aluminum, and they have a gripping technology to keep the bench stable once you get it in place. The blown plastic seat provides a no-slip surface, and it makes it very easy to clean and maintain. This bench is held together by tight-fitting screws, and it can hold over 300 pounds. 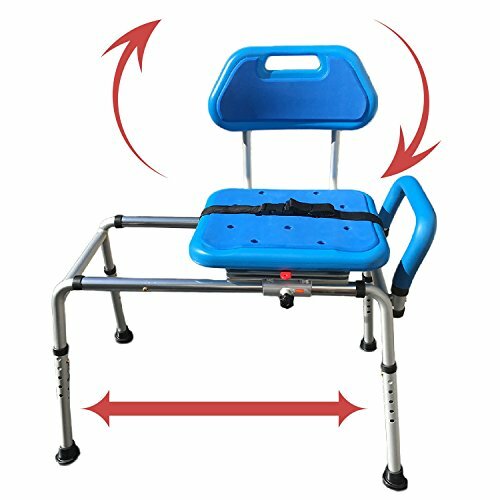 This transfer bench comes with durable blown plastic and a reversible backrest that can easily accommodate both left and right transfers. You can adjust the seat from 18 inches off of the floor up to 22 inches. This allows you to use it with several bathtubs. You can remove the armrest with the push of a button, and the bench and backrest are both textured for a no-slip surface. The backrest is also reversible, and the legs have non-slip latex-free safety tips to adhere the transfer bench to the bottom of the shower or bathtub. This transfer bench lets you sit in one place and slide from the left or the right for a safe and seamless transfer. It folds flat so you can transport and store it quickly and easily. The legs are made out of sturdy aluminum. In addition to the bench, you get a removable soap dish, a safety net, and a safety belt. These allow to you keep your items close, and it prevents you from bending for dropped items. The seat adjusts in half-inch increments so you can get the perfect height. This spacious transfer bench comes with a rounded edge that makes it very easy to transfer on and off this bench. It holds a maximum weight of 400 pounds, and it has a slight lip on the edge to help with stability. 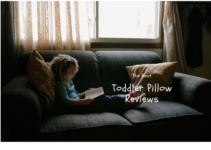 It has larger solid legs, and the hand grip is ergonomically designed with soft padding for added comfort. You get a limited lifetime warranty on this chair as well. There is a non-slip surface on this chair, and you can adjust it to several different heights, so you get a good fit for your bathtub or shower. 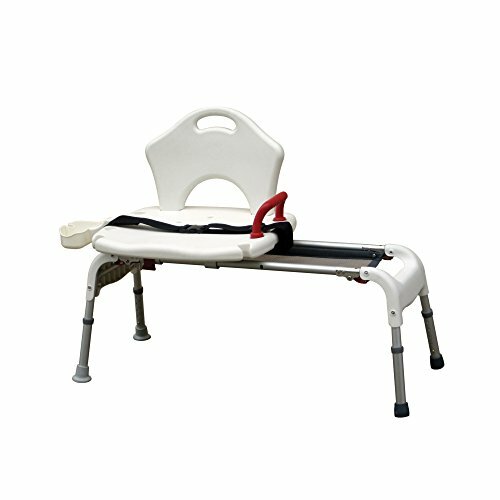 You’ll get a multi-level adjustable transfer bench with this product. It has a two-handled back rest that makes it easy to move around, and it makes it easy to convert for either left or right-handed transfers. The durable plastic design can hold up to 400 pounds. It has a very compact design that allows it to fit into most sized bathrooms easily. The entire bench is made out of plastic, and this means that it’s resistant to corrosion and that there is nothing to rust. The legs lock easily in place, so you don’t have to worry about it falling. You get a removable cutout section that lets you bathe completely with this bench. It has an extra wide seat surface for added stability, and the bright blue color makes it easy to see all of the parts without worrying about slipping. 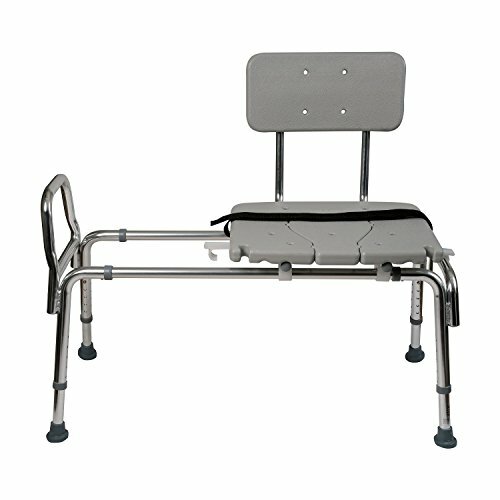 The transfer bench’s frame is made of medical-grade aluminum that is resistant to rust and corrosion. The front support bar has a u-shaped design, and this lets you hold on and grip it easily and quickly. 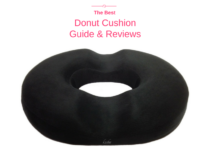 It’s designed to handle up to 400 pounds, and it’s very lightweight at just over 12 pounds. This bench clamps to most tub siding to make getting in and out of the tub or shower easy and safe. 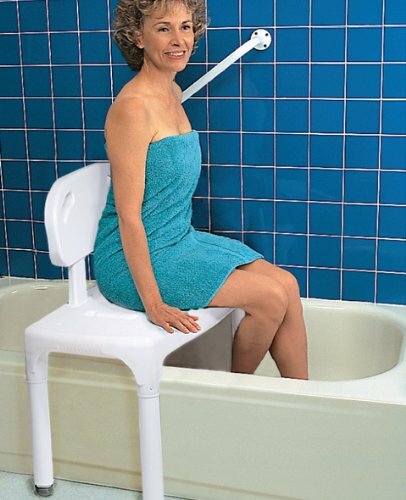 You can sit on the chair, swivel it so you’re in the tub, and easily slide it into position. This product comes with a lap belt that clips on for a secure hold, and the durable backrest offers support. The seat swivels 360-degrees, and it locks at every 90-degrees. It can hold up to 350 pounds, and the frame is made out of lightweight aluminum and heavy-duty no-slip plastic. 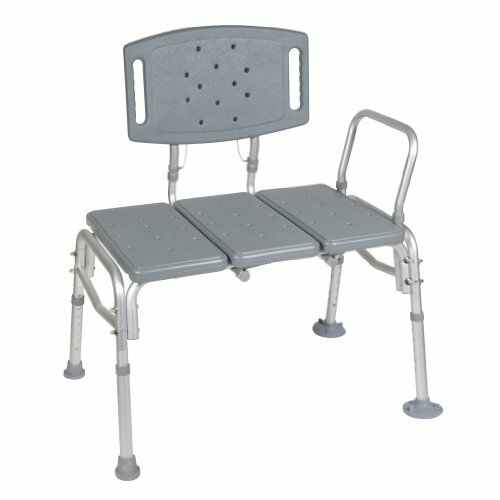 Shower transfer benches are a great option for anyone who has trouble moving or who is aging. They can help give a person their confidence back, and they may even prevent a fall or injuries. Our buying guide gives you the important criteria you want to keep in mind when you’re shopping, and our top 10 best shower transfer benches let you compare high-quality models so you can make an informed decision.